The Echo Input is a slender puck that turns a dumb speaker into an Amazon Alexa-connected smart speaker, at about half the price of buying an Echo Dot. 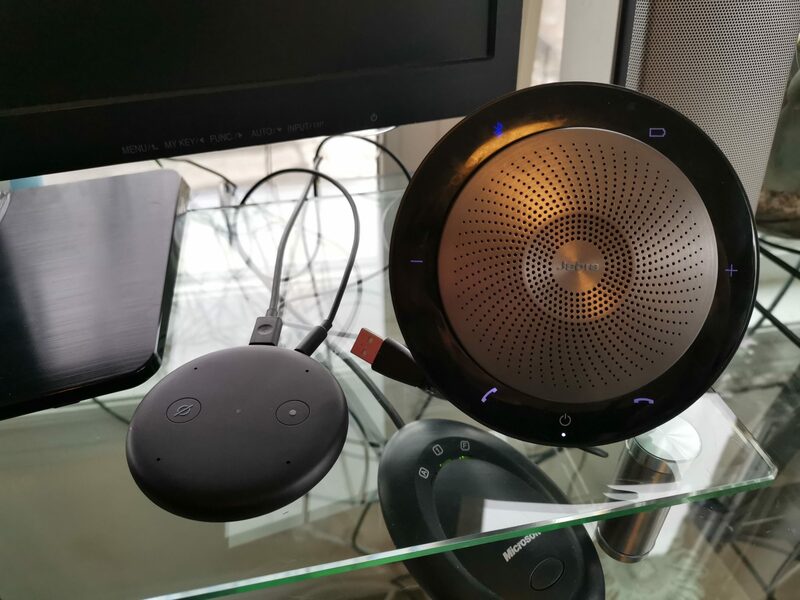 It’s just the latest device in what’s becoming a long list of ways to connect to Alexa, Amazon’s ubiquitous voice assistant that’s becoming a part of many homes and more recently, offices, with the Alexa for Business service. After Amazon introduced the original Echo smart speaker in 2013, it realized that not everyone wanted to buy a whole new speaker just to get access to Alexa. The price point was hard to justify if you already had a great set of speakers to listen to music, which studies show is one of the primary uses of Alexa devices. To solve that problem, Amazon introduced the Echo Dot (now in its third generation), which offered an auxiliary cable to connect to any speaker that offered a 3.5 mm input. So the Echo Input is just like the Echo Dot in that function. It just doesn’t have a speaker of its own, so it can’t operate independently. In exchange for sacrificing that functionality, the Echo Input is priced at $44.99 – half the price of the newest Echo Dot. It’s still available from Amazon.ca for its introductory price of $29.99 (as of March 31). Given that most people already own a speaker they’d prefer to use over Echo hardware, the low price, and the simple setup, the Echo Input is both the newest and best option for adding Alexa to your home or office environment. If you’ve hidden a Bluetooth speaker away in a drawer somewhere, get it out and blow off the dust as this could give it new life. There’s the black disc-like Input device itself, which is about the circumference of a hockey puck, but just one-third the thickness. There are two cables, a micro-USB to USB cable that provides power to the device (a plug is included too), and a 3.5 mm to 3.5 mm audio cable. To start, plug your Input into a power source. Use the included plug to connect to an outlet, or you can plug the USB input to a device that will provide power. Some speakers offer this, so look for it as a way to avoid overloading your electrical outlets. For my setup, I added Alexa to my home office desk. I have a Bose stereo speaker set that offers a hub with a 3.5 mm input. This allows for both my laptop and the Echo Input to play through the speakers at the same time. Next, connect the audio cable to a speaker. This is not totally necessary, but Alexa will wake up and provide you with some basic audio instructions and feedback during the setup process. Since you can’t add a Bluetooth connection before connecting to your Wi-Fi network, the aux input is the only option for this. At this point, you should see an orange light on the Input’s LED. Open up your Alexa app and add a new device. Follow the wizard to complete the setup and you’re ready to start bossing Alexa around. You also have the option of adding the Input to Multi-Room Music Speakers groups through the app. I was able to put my Echo Input in a group with my Echo Spot, which lives in the kitchen. But when I asked Alexa to play music on that group, it didn’t work. The app showed the song as playing, but audio couldn’t be heard on either speaker. When I used the Spotify app to play to the group though, it worked fine. I wondered what would happen if I had the Input connected to both a Bluetooth speaker and the aux input speaker at the same time. My testing demonstrated that Alexa will play audio to the most recent connection made. So if you have Input plugged into the cable, then connect it to Bluetooth, it will play via the Bluetooth speaker. If you have it connected via Bluetooth and plug in the cable, it will play via the hardwired speaker. I ran through some Alexa commands to try out the Input and it didn’t miss a beat. It played music, reported the weather in my city and in San Francisco, reported on sports scores and schedules, and did some basic math. Of course, that’s what you’d expect because the Input is connecting to the same Alexa in the cloud that all Echo products do. The Echo Input is a smart addition to the Alexa hardware by Amazon. The Echo Dot is so popular because of its lower price point and its capability to connect to other speakers. Now people will have an even lower-cost option to do that. It’s also going to market just after Google discontinued its Chromecast Audio device. This device connected any speaker in much the same way the Input does, but didn’t include an onboard microphone. So users were limited to controlling that speaker from their smartphone, or via voice commands to other Google Home speakers on the same Wi-Fi network. 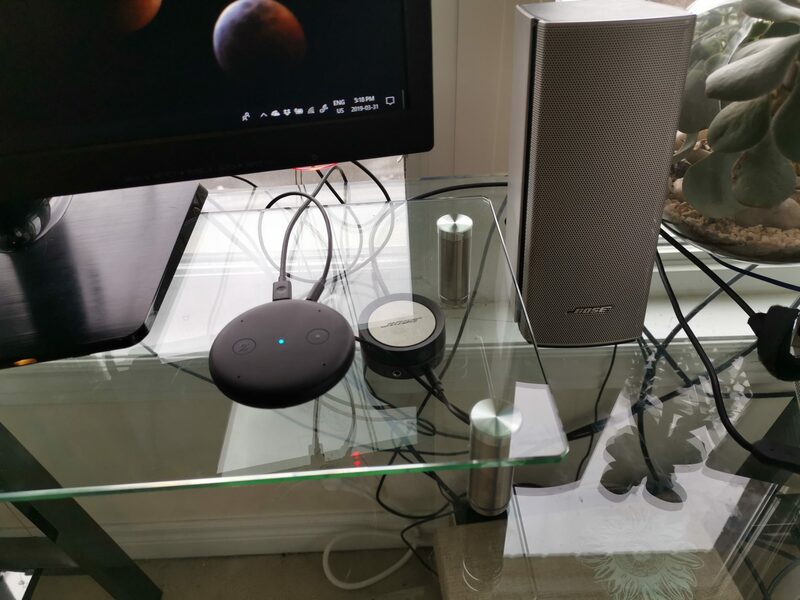 I used the Chromecast audio to connect a speaker in a spare bedroom, to complete my whole-home audio setup. It’s especially disappointing that Google discontinued it, because even the Home Mini doesn’t offer an audio output the same way the Echo Dot does.